In my entry on Brunkow Cheese Cooperative yesterday, I mentioned visiting two cheese factories on my way home from Iowa. 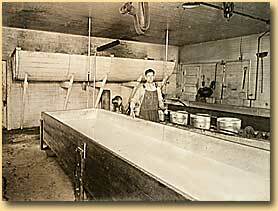 The second was Carr Cheese Factory, home of Gile (pronounced just like "guile") Cheese in Cuba City, Wisconsin, Pop. 2074. * The factory is named for the family that donated the land, but the cheese is named after the family that makes the cheese. Cletus Gile bought the factory in 1946. That photo shows Cletus' father, who worked at the factory from its founding in 1921. One of Cletus' sons, Tim, was manning the retail store when I dropped in for some aged cheddar, and he described the history of his business, of which he is rightly proud. You can read more about that here, on their company website. According to Tim, two cheeses are their most popular (and award winning): Baby Swiss and Colby. I bought some of both, and while I was there, I purchased some eight-year-old cheddar, too. Baby Swiss is very mild, usually a bit too mild for my taste. I will write more about that in a future post. Colby Cheese is also very mild. It was developed in Colby, Wisconsin, and I will hold off writing more about that until I visit the source. For this entry, I will focus on aged cheddar. In "The Cheese Shop," Monty Python observes that Cheddar is "the single most popular cheese in the world." That may be true, but mozzarella has surpassed cheddar as the most popular cheese in the U.S. Still, cheddar is a wonderfully flexible cheese, and it is very popular in Wisconsin. Of course, it is named for a village in England, where it has been manufactured for at least 800 years. It's taste can range from very mild to very sharp, with aging being the primary driver of sharpness. Also, as the cheese ages, its texture turns from creamy to crumbly. If you are accustomed to purchasing cheddar in a grocery store, you are familiar with the designations "mild," "medium," "sharp," and "extra sharp." To give you some sense of the aging, Tillamook ages its cheddars as follows: medium cheddar (60 days), sharp cheddar (minimum of 9 months), extra sharp cheddar (minimum of 15 months). Tillamook doesn't sell a mild, but you can assume that mild cheddars are aged from a couple of weeks to a few months. When you are buying aged cheddar, you are buying "sharp" or "extra sharp" cheese, and these descriptions lose their value in distinguishing among the various forms of aged cheddar. In this market, the main descriptor is the number of years the cheese is aged. The most popular aged cheddars are no more than five years old. Unless you have developed a keen taste for aged cheddar, going beyond five-year-old cheese could be a shock to your taste buds. The eight-year-old cheddar from Gile Cheese was outstanding. Sharp and crumbly, but not dry. Cheese of that age contains calcium lactate crystals, which occur naturally during aging. Both calcium and lactose are found in cow’s milk, and during the production process, the lactose ferments, becoming lactic acid, which associates with the calcium to form a salt crystal. In addition to enhancing the sharpness of the cheese, the crystals make aged cheddar crunchy. * According to Tim Gile, Cuba City was first called "Yuba," but when the city's founders discovered that "Yuba" had already been taken by a small town to the north, they searched for a new name by beginning at the top of the alphabet and rhyming with Yuba. "Auba"? No. "Buba"? Definitely not. "Cuba"? Cuba! "City" was added to the end of the town's name by the person who made the sign for the railroad station. He wrote "Cuba City," and it stuck. Apparently, they get visitors now and then from Havana, who want to buy t-shirts.